Unfortunately, the subpar employee engagement rates worldwide have barely moved since 2000. That’s because, rather than investing on programs that improve engagement, a lot of managers are more concerned about running surveys and getting “encouraging” results. Having gaps between the relationships in your workplace is a big elephant in the room. If you want to improve employee engagement across your organization, you need to invest more in getting employees more than just acquaintances. You need activities that build friendships, which will make them more accountable and driven to excel. It’s also very likely that your organization already has some employees more engaged than others. You should learn what makes them different and understand how you can instill the same qualities in other employees. Encouraging your employees to exercise is a long-term investment that not only maintains their health but also boosts their focus and productivity after returning from workouts. You’ll also be seeing less sick days from your team if you let them spend at least 2.5 hours per week for physical exercises. A good strategy is to provide employees with gym equipment at the office. Alternatively, show them that it’s okay to integrate their workout habits with their day-to-day office responsibilities. As a business leader, you can do this by setting an example and occasionally showing up at work in your workout gear. 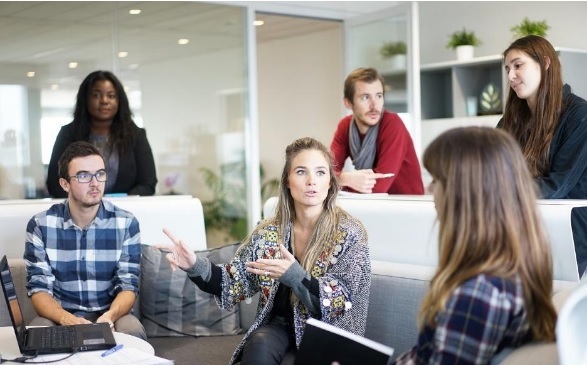 A study by the York College of Pennsylvania’s Center for Professional Excellence shows that the immediate recognition is necessary for driving the millennial workforce. Even if you don’t have an elaborate recognition or rewards program, a simple thank you note posted on a corkboard can go a long way. What’s important is that you show your appreciation towards hardworking employees and let them be shining examples that will lead the rest of the team. There’s no one-size-fits-all strategy for employee rewards, so here’s a long list from American Express that can help you. There are tons of simple ideas out there that can foster a better, more fun culture for your employees. But the best way to identify the best approach is to start with the employees and ask for their input. After all, no one else knows the employees’ roles more than the employees themselves. To pull every employee into a single direction, make sure your business highlights a clear vision statement. Identify the main reason behind the company’s existence and put it on paper. Ideally, you should already know your company’s mission before it was even founded. If not, you can ask your key employees to write a short description on what they think the company does. From all the answers, write a single mission statement in 2-3 sentences. However, identifying your business’s vision statement is only the first step. Every employee must also be aware of how their roles contribute to the company’s purpose. This is something you need to include when creating job descriptions for new hires. Ultimately, you need to do your part as a business leader of growing with the rest of the team. The truth is that employee engagement is too complex to be covered with a single guide alone. Be sure to invest in your knowledge about the matter, measure your strategies, and maintain a workplace that adjusts to the changing needs of your team. What do you think is the best way to get your employees more involved and committed? Your words of wisdom will be highly appreciated, so feel free to leave a comment.